Most days of the week we have some sort of meat on our plates, but every now and then I like to have a meatless day. 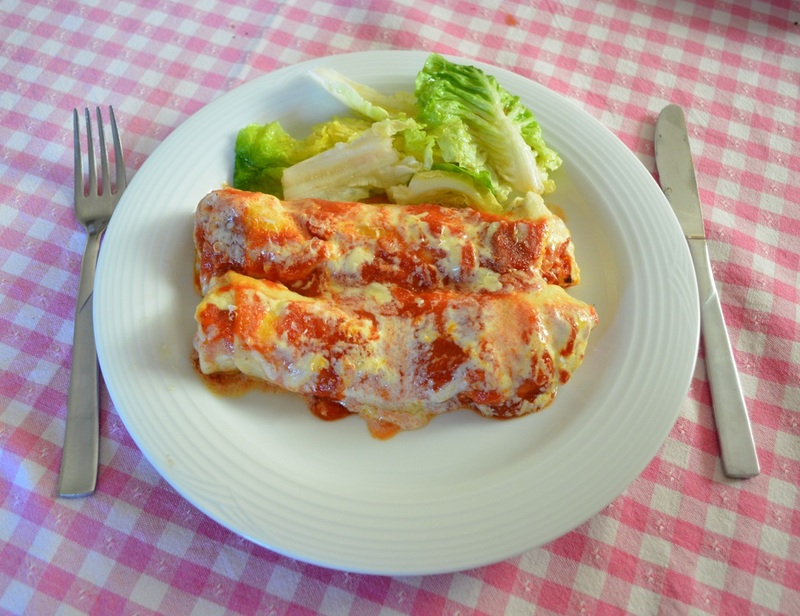 I made this as this is what I like to eat, I love cannelloni, I love spinach and ricotta. Now I knew my daughter would love this to, as she loves crepes, spinach and ricotta, my husband I wasn't sure about, my oldest son was at a friends house, and my youngest hates ricotta, so I knew I'd have to make him something else (each kid is allowed to hate one thing in our house, so this is my baby's thing). But it was Friday afternoon and my 8 year old didn't feel like going to his Karate class, if we didn't go to karate, I didn't want to go buy him something else to eat as the shops are near karate. So I said to him, if he doesn't go to karate, he has to eat an entire spinach and ricotta crepe, without whinging once or making any silly faces. We shook on it. So I made dinner, and it was delicious. I loved it, my daughter loved it and surprisingly my husband loved it, we all found it delicious. As for my eight year old, he ate it without whinging and without any drama at the table, gave me a 5/10 for it, I thought that was great as this is the absolute first time I could get him to eat ricotta. As for the rest of us, it was a 10/10 for us. Simple, tasty and easy to prepare. The crepes were soft, the filling puffs up like a pillow, the sauce and cream completes the dish. The crepes, tomato sauce and filling can be made several hours in advance, even the day before, just keep refrigerated until needed. I like to assemble close to baking, but in all honesty you could probably fill the crepes an hour before baking, again, just keep refrigerated until needed. With the spinach, make it to taste, if you want less, add less, if you want more, add more. 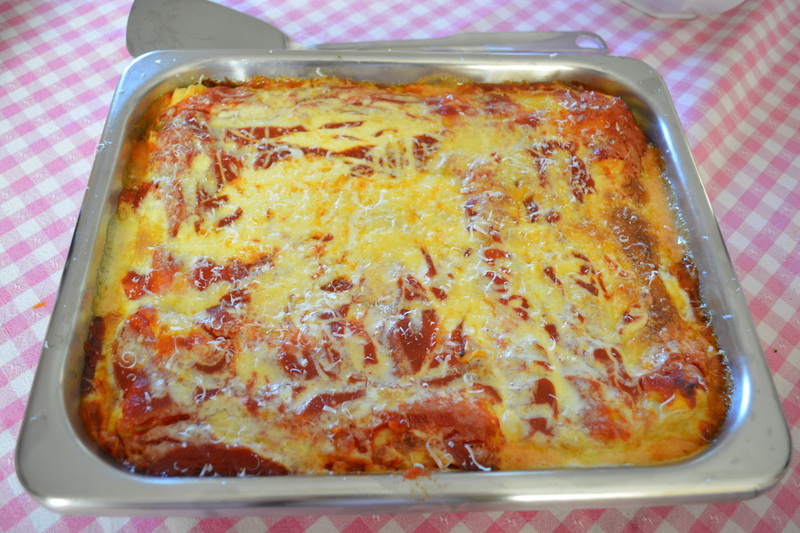 You can use tomato pasata if you prefer, either way it is delicious. I love when my kids want to help out in the kitchen, today my daughter wanted to fill and roll the crepes, so I let her, and she did a great job. This will definitely be made at my house again, as it is quick and easy to make and tastes great. 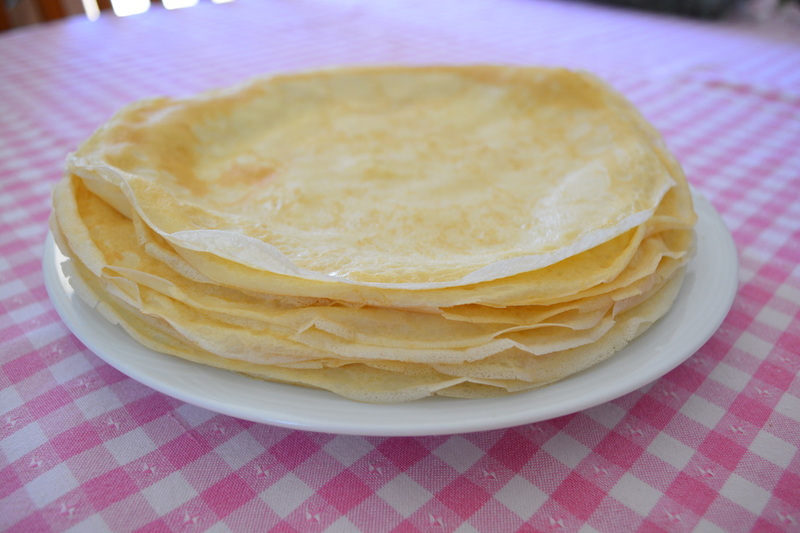 Make the crepes: Place the eggs in a mixing bowl, add the flour. Add half of the milk; using a whisk, whisk until your mixture is lump free. Keep adding milk slowly until all the lumps have disappeared, then add remainder of milk, mix through. It is easier to get the lumps out, if the mixture is thick, so don't add all the milk in straight away. Leave to stand for 30 minutes. Strain the mix through a sieve to make them completely lump free-I however never do, more cleaning up, and a few tiny lumps don't make a difference. This is double the quantity of crepes needed, as my kids love them for dessert to. Fill a large saucepan 1/3 of the way up with water. Place over high heat, bring to the boil. Blanch the spinach for 30 seconds to a minute or until soft and wilted. Drain water, allow to cool. Make the tomato sauce: Heat the oil in a medium sized saucepan over medium heat, add the garlic, stir for 30 seconds. Add the tomatoes, sugar, salt and pepper. Reduce heat to low, simmer for 10-15 minutes. Stir the sauce every now and then, add small amounts of water during the cooking process if your sauce is starting to thicken to much. Once cooked, turn off the heat and stir the torn basil through the sauce. Squeeze out all of the excess water out of the spinach. Finely chop. In a large bowl add the ricotta, spinach, egg, salt and pepper. Mix well to combine. Taste for seasoning, add more if needed. Lightly grease a baking dish large enough to fit 10 cannelloni crepes. Place one crepe on a work surface, add spoonfuls of the ricotta mixture (approximately 3cm wide, 2.5cm high) along the centre. Roll up the crepes and place it in the baking dish seam side down. Repeat with all the 10 crepes. 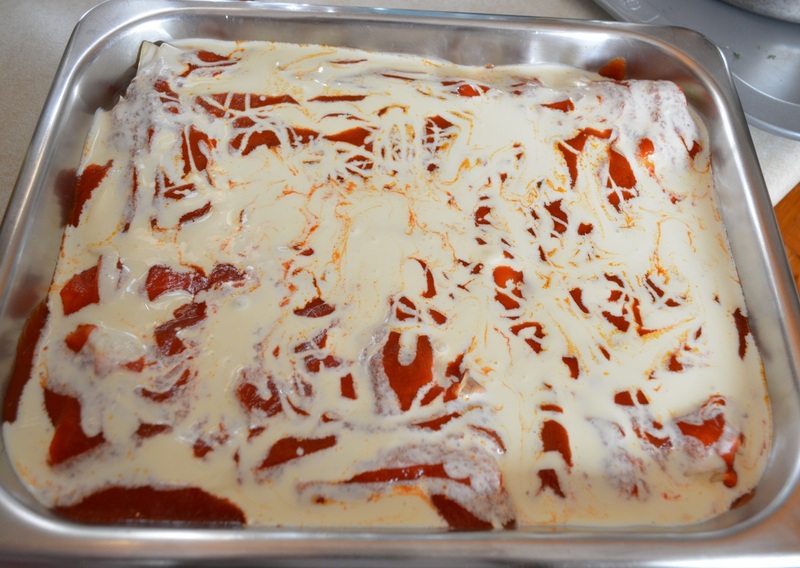 Pour large spoonfuls of the tomato sauce over the top of the cannelloni to just cover them. Drizzle the cream over the sauce. Bake for 25-30 minutes or until it is golden, bubbling and looks cooked.